One Friday morning, three Belmont sophomores with a passion for chasing God met in Belmont’s iconic Bell Tower with 20 other women who were interested in starting a campus-wide Bible study. The group named the study “Delight” and made it a regular occurrence throughout the rest of the semester. They established a mission of building community that fosters vulnerability and transforms stories, and they worked hard to create an environment that allowed for honest and transparent discussion. The study expanded beyond the Bible and soon, the women began cooking dinner together, serving hot chocolate to the homeless together and learning to live more like Christ together. By the end of their sophomore year, the group of three women grew to nearly 100 who shared the same passion for Christ. Fast-forward to 2017, and Delight Ministries is now the only nationwide college ministry for women. There are chapters of the organization on over 80 different college campuses across the U.S., built of more than 400 campus leaders and 4,000 members. Delight Ministries co-founders and 2015 Belmont University graduates Mackenzie Wilson and Mackenzie Baker, who were among the original group of three women, now run an office on Blair Blvd as the organization’s headquarters. They handle their own content creation, marketing and even host interns that plan leadership conferences and events for all chapters. 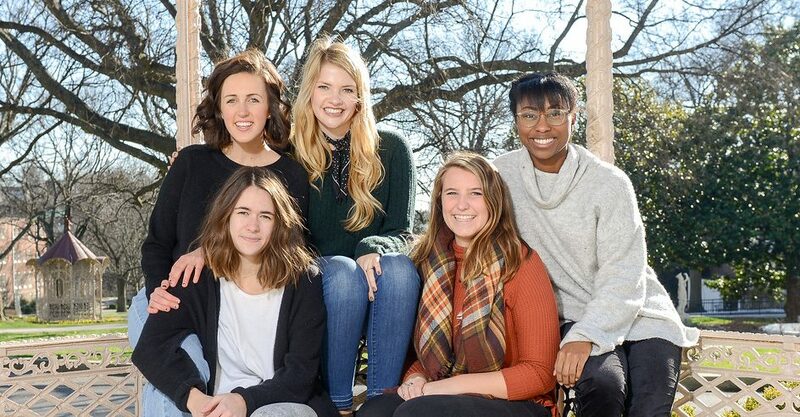 As the leaders of Belmont’s chapter, Wade and the other six women organize the group’s weekly meetings, worship nights, service events, leadership team meetings and community events while maintaining an open, vulnerable and safe space for members to learn about God. According to Wade, one of the most transforming aspects of being involved in Delight is the community that has been built on campus. Wilson and Baker are thankful for all of the Belmont faculty and staff who supported them during the initial years of their ministry with Delight. For more information on Delight Ministries, its purpose and its current chapters, visit its website.